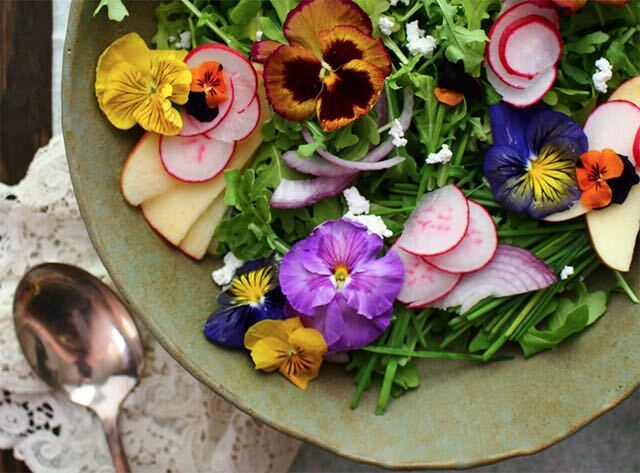 I felt my heart skip a beat when I saw Lauren McDuffie’s photo of the wildflower and arugula salad on her blog, Harvest and Honey (see below!). It looks delicious and those edible flowers on top make it downright fairytale-like. It also inspired me to look for more ways to include flowers in cooking and baking. 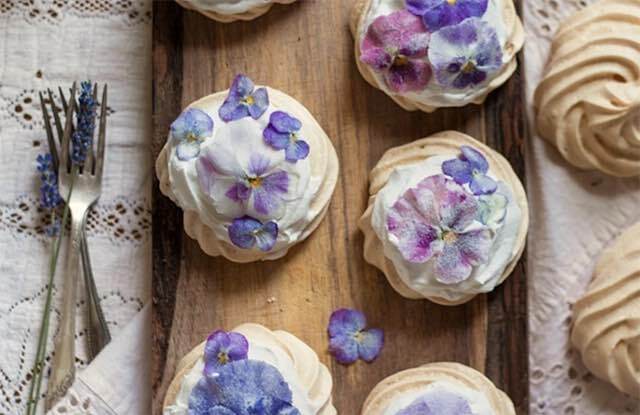 Here are the best edible flower recipes I’ve found. Leave no stone unturned. But no matter where your search may lead, I am willing to bet that you will never come across a bottled or store-bought salad dressing that in any way rivals one that is made fresh, right at home. The recipe includes basil, chives, apples, and orange blossom honey among its ingredients. Yum! These delightful treats are from Adventures in Cooking, in collaboration with Luna Moss. 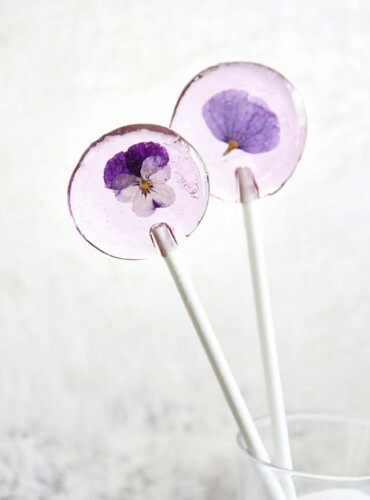 They’re adorned with candied pansies and violas, and the blog post also features other recipes — scroll down towards the end to see this one. To see the recipe, go to Adventures-in-cooking.com. I think Farm Fresh Feasts wins a blue ribbon for this highly creative recipe. 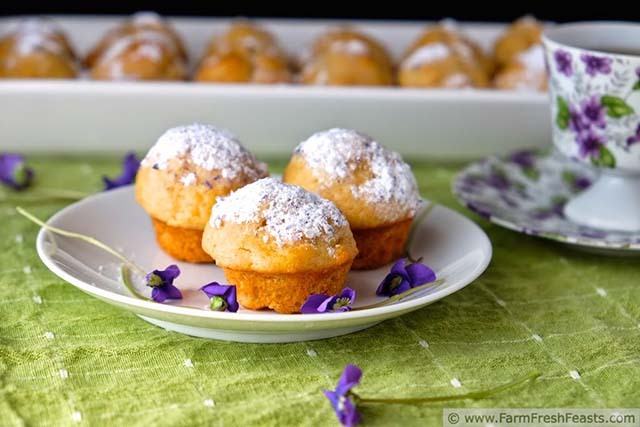 It incorporates wild violet syrup and sugar (recipes for both are included), and the muffin tops are dunked in melted butter. Sigh. For the recipe, you can find it here on FarmFreshFeasts.com. 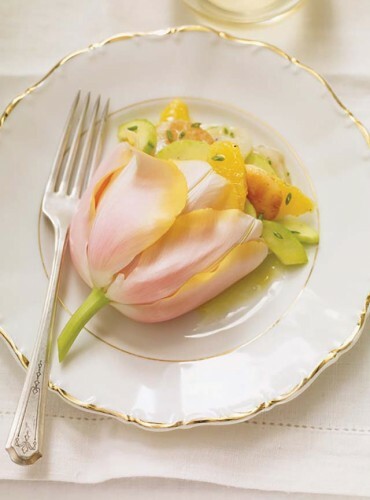 Ricardo Cuisine came up with this pretty idea to use a tulip to encase a dish. The recipe is easy to make, and counts chives and cucumber among its ingredients. To see the recipe, go to RicardoCuisine.com. These flower-entombed lollis remind me of glass paperweights. They’re beautifully luminescent and gem-like; kids will certainly be delighted by them. I think they’d also go over great with adults, as party favors at weddings and other occasions. For the recipe, go to SprinkleBakes.com. 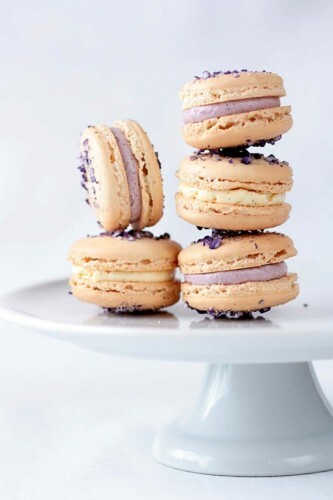 Tartelette Blog came up with this incredible dessert topped with crushed violet pearl sugar. Powdered sugar and almonds set the backdrop to what is a mouth-watering French surprise. For the recipe, visit TarteletteBlog.com. You’d think there were blueberries in this jam, but there aren’t. 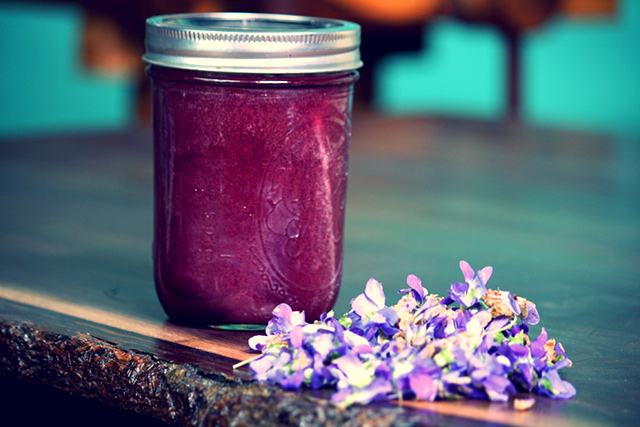 Violets give it that rich purple color, as well as the delicate flavor. (Michele of Borganic says she’s also thrown in lavender at times.) If you’ve never made jam it’s easy; the most time-consuming part is sterilizing the jars — a necessity, but well worth it. To find the recipe, go to Borganic.net. There is a special place in Stockholm where we go when we want to get closer to nature, and it is incredibly beautiful this time of the year . . .
Talk about magical! You won’t want to miss this unique trip into a life and world that’s as dreamy as it gets. The cake includes a long list of ingredients, from nuts and hemp seeds, to lemons and raspberries. To see the recipe got to GreenKitchenStories.com. 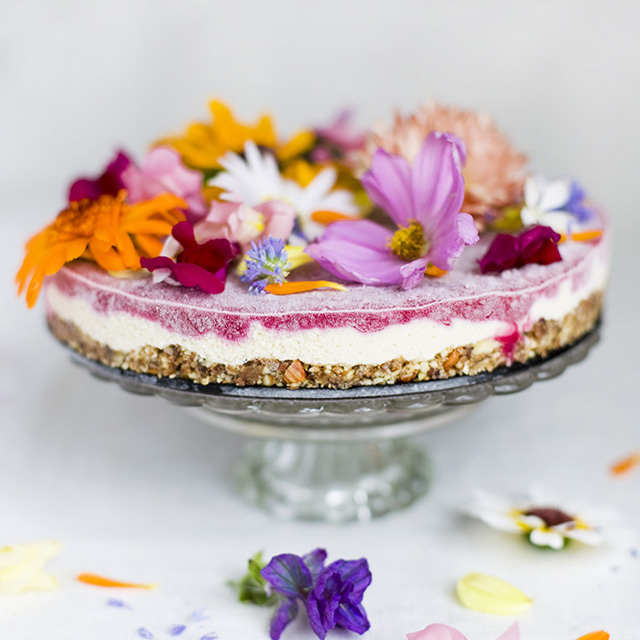 Do you have any great edible flower recipes? Leave a link!